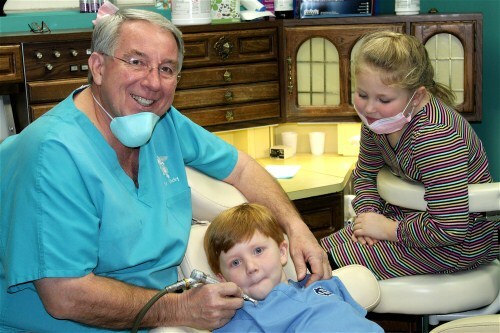 The Chamber has presented a 2011 Jimmy Creech Small Business Person of the Year Award to long-time Selma dentist, Dr. Dicky Parrish. The award was sponsored by Stancil Oil Company. Dr. Parrish was born and raised in the northern part of Johnston County. He is a 1976 graduate of the University of North Carolina School of Dentistry and was chosen for the Academy of General Dentistry Award from the graduating class. He was later honored in Pinehurst by the Academy of General Dentistry. Right after completing dental school, Dicky moved back to Johnston County and opened his dental office on Waddell Street in Selma. He continues to practice there today. Several years ago he purchased the practice of Dr. Jerry Wood as Dr. Wood was retiring. He has been a successful and generous business person for the past 35 years. One of his passions is serving his community through the Selma Lions Club. Having joined the club the same year he moved to Selma, has held several leadership positions, including president a number of times. Dr. Parrish is a member of Selma Baptist Church where he was ordained a Deacon in 1978 and has served on many committees, including the Stewardship Committee, the board of trustees and led the steering committee for the construction of the new church sanctuary. He went on his first mission trip to the West Indies in 1980 where he helped setup and run free dental clinics for people who did not have access to health care. He continues to be active with local missions. He has always had an interest in education and joined the Selma Elementary parent Advisory Council in 1979 and he continues to be involved with the school. Most recently he has volunteered as a mentor with the Lunch Buddies program. It is not uncommon to find him searching the aisles at the Selma IGA for snacks to fill the backpacks of needy students for another worthy program, the Back Pack Buddies. He was elected to the Johnston County Board of Education in 1986 and became the chairman in 1989. His leadership eventually led to a major capital program in the county to replace all of the old 3-story buildings with new modern facilities. Dr. Parrish has been involved with many other local organizations, including the Partnership for Children of Johnston County, the Johnston County 4H program, the Boys Scouts and Girl Scouts, the Johnston County Chapter of the American Cancer Society and the Johnston County Boys and Girls Club. He is also a member of the Board of Directors of the Selma branch of BB&T. From a professional standpoint, he has served as the president of the University of North Carolina Dental Alumni Association and a director for the university’s general alumni organization. In 1987, the Chamber named him the Smithfield-Selma Area Citizen of the Year. Any free time he has is spent shooting hoops with his grandchildren, riding the tractor around his farm, and finding ways he can help improve the lives of the citizens of Selma, especially local kids. He is an active business leader and has devoted his life to making Selma a better place for citizens to work and live. Selma Mayor Cheryl Oliver says of Dr. Parrish, “Whenever I think of Dicky Parrish, I think of a man in motion. With a smile on his face, he’s always on the move to be of service to others. He blends the role of family man, community servant and business professional in a manner that makes it hard to see where one role ends and the other begins. He is without a doubt a shining star in Selma and the surrounding community".